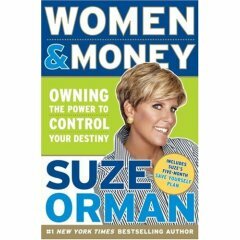 Oprah Winfrey is giving away digital copies of Suze Orman's book, Women & Money, but the deal ends tonight at 7pm Central.... So hurry on over! The book is the real deal without any gimmicks. It is a PDF of the whole book, but the terms of the download say you're not allowed to share, copy, or forward your copy of the book. Women & Money: Owning the Power to Control Your Destiny includes a five month plan Suze has crafted to help "save yourself." What Suze wants you to do, is to basically educate yourself on the most critical parts of being financially responsible, and she gives you action steps to move toward that. Suze says simplicity is the key, so the plan is not complicated. The book has gotten great reviews, and its focus on women is necessary. Women approach money differently than men, so Suze thought it was the right time to address just women in educating them on money. If you don't get to this offer in time for your free download, you can still pick it up on Amazon.com.